Mycobacterium tuberculosis bacteria are known to suppress proinflammatory cytokines like IL-12 and TNF-α for a biased Th2 response that favors a successful infection and its subsequent intracellular survival. However, the signaling pathways targeted by the bacilli to inhibit production of these cytokines are not fully understood. In this study, we demonstrate that the PPE18 protein of M. tuberculosis inhibits LPS-induced IL-12 and TNF-α production by blocking nuclear translocation of p50, p65 NF-κB, and c-rel transcription factors. We found that PPE18 upregulates the expression as well as tyrosine phosphorylation of suppressor of cytokine signaling 3 (SOCS3), and the phosphorylated SOCS3 physically interacts with IκBα–NF-κB/rel complex, inhibiting phosphorylation of IκBα at the serine 32/36 residues by IκB kinase-β, and thereby prevents nuclear translocation of the NF-κB/rel subunits in LPS-activated macrophages. Specific knockdown of SOCS3 by small interfering RNA enhanced IκBα phosphorylation, leading to increased nuclear levels of NF-κB/rel transcription factors vis-a-vis IL-12 p40 and TNF-α production in macrophages cotreated with PPE18 and LPS. The PPE18 protein did not affect the IκB kinase-β activity. Our study describes a novel mechanism by which phosphorylated SOCS3 inhibits NF-κB activation by masking the phosphorylation site of IκBα. Also, this study highlights the possible mechanisms by which the M. tuberculosis suppresses production of proinflammatory cytokines using PPE18. The macrophages elicit various antimycobacterial mechanisms during the innate phase of activation that play crucial roles in deciding the outcome of Mycobacterium tuberculosis infection (1). Among these, production of proinflammatory cytokines like IL-12 and TNF-α is critical for mounting an optimal defense against mycobacterial infection (2–5). The TNF-α is important for granuloma formation and induction of cytotoxicity against the bacilli (6, 7). In contrast, IL-12 plays a crucial role in activating the protective Th1 immune response (5, 8, 9). Regulation of proinflammatory responses often involves diverse signaling cascades, and the pathogenic M. tuberculosis bacteria have evolved several mechanisms to modulate these signaling pathways to suppress IL-12 and TNF-α production to favor its long-term survival and persistence inside the host (10–12). Interestingly, virulence of pathogenic mycobacteria is found to be inversely correlated with the levels of IL-12 and TNF-α secreted (11–14). Human monocyte-derived macrophages (MDMs) are shown to produce a significantly lower amount of IL-12 after exposure to M. tuberculosis than other bacteria (9), indicating that M. tuberculosis specifically targets the signaling cascades that lead to production of this cytokine. However, the molecular mechanisms by which the pathogenic mycobacteria can downregulate induction of these proinflammatory cytokines are not fully understood. The mycobacteria are characterized by the presence of two unique gene families, the proline-glutamic acid and the proline-proline-glutamic acid (PPE) (15), which are highly expanded in pathogenic species like M. tuberculosis (16). Although the proteins are predicted to play a role in generating antigenic variation (17–20), the functional role of these proteins in mycobacterial pathogenesis is not clearly understood. Some of these genes are predicted to play an important role in mycobacterial persistence inside the host and are crucial in M. tuberculosis pathogenesis (21–23). Recently, we reported that a PPE family of proteins of M. tuberculosis, PPE18, inhibits the Th1-type response by specifically downregulating IL-12 p40 and other proinflammatory indicators (24). We found that PPE18 binds to the TLR2 leucine-rich repeat (LRR) 11–15 region and causes an inhibition of IL-12 p40 (24). It appears that PPE18 probably targets the proinflammatory signaling downstream of TLR2 by activating certain negative regulators of this pathway. Interestingly, suppressor of cytokine signaling 3 (SOCS3) downstream of TLR2 (25) acts as negative regulator of proinflammatory signaling (26–29). Because several pathogenic mycobacterial species induce expression of the SOCS3 protein (30–32), we speculated that probably SOCS3 protein is involved in the suppression of induction of IL-12 p40 in macrophages treated with PPE18. The SOCS3 protein is known to play important roles in the regulation of proinflammatory responses during infection (25–28, 33, 34). Constitutively expressed SOCS3 was found to favor development of Th2-type response and correlate well with the severity of Th2-mediated disease like atopic asthma (35). Further, SOCS3-transduced dendritic cells are found to be effective inducers of Th2-type T cells in vitro and in vivo through reduced production of IL-12, IFN-γ, and IL-23 p19 cytokines (36). Although the mechanisms are not clear, SOCS3-transduced dendritic cells are shown to be effective inducers of Th2-type T cells in vitro and in vivo (36). Various studies have indicated a direct role of SOCS3 in downregulating the IFN-γ signaling pathway (37, 38). SOCS3 is known to predominantly target the STAT family of proteins to attenuate IFN-γ–specific proinflammatory signaling (31, 39, 40). But it could be possible that the effect of SOCS3 is not restricted to STAT signaling alone but also to other signaling pathways to downregulate IL-12 and TNF-α cytokines during tuberculosis. Although mycobacteria are known to increase SOCS3 expression in macrophages (31, 32), their significance in the macrophage innate-effector response in tuberculosis is not well understood. It is possible that the bacilli exploit the SOCS3 signaling pathway to inhibit proinflammatory cytokine induction in macrophages. In this study, we describe a unique signaling pathway responsible for the SOCS3-mediated downregulation of proinflammatory cytokines that involves the IκBα–NF-κB/rel signaling and conclude that PPE18 targets this signaling pathway to suppress induction of IL-12 p40 and TNF-α cytokines in activated macrophages to favor a Th2-type response (24) that helps its replication and persistence of the bacilli inside the hosts. The rPPE18 protein was expressed and purified as described earlier (24). The purified recombinant proteins were dialyzed against several changes of PBS. The protein concentration was determined using a kit that employs the bicinchoninic acid method of protein estimation (Pierce, Rockford, IL) and was incubated with 10% v/v polymyxin B-agarose (Sigma-Aldrich, St. Louis, MO) (41). The purified protein had a very low endotoxin content (<0.05 EU/ml) as measured by the E-toxate (Limulus amebocyte lysate) kit (Sigma-Aldrich) and was used for all in vitro experiments. The human monocytic cell line THP-1 was obtained from the National Centre for Cell Science, Pune, India. The suspension cell line was maintained in RPMI 1640 medium (Invitrogen) supplemented with 10% (v/v) heat-inactivated FBS, 2 mM l-glutamine, 100 U/ml penicillin, and 100 μg/ml streptomycin (all from Invitrogen) at 37°C in a 5% CO2 humidified incubator. The THP-1 cells were differentiated to macrophages by incubation with 20 ng/ml PMA (Sigma-Aldrich) for 24 h followed by a rest for overnight in media containing 1% FBS. Human PBMCs obtained from Lonza (Walkersville, MD) were diluted in RPMI 1640 medium (Invitrogen) containing 10% FBS and seeded in 100-mm petri dish at a density of 20 × 106 cells. The MDMs were purified as described elsewhere (42). PMA-differentiated THP-1 macrophages or human MDMs were treated in triplicate with either increasing concentrations of rPPE18 or a fixed concentration (3 μg/ml) of rPPE18 protein in the absence or presence of 3 μg/ml bacterial LPS (Sigma-Aldrich) (24). In some experiments, tyrosine kinase inhibitor genistein (100 μM) (Merck-Calbiochem, Darmstadt, Germany), p38 MAPK-specific inhibitor, SB203580, or known Src kinase inhibitors like SU6656 or PP2 (AG 1879) or Src Inhibitor-1 (all purchased from Sigma Aldrich) were used. Cells were pretreated with SB203580 or Src kinase inhibitors 1 h before incubation with rPPE18. Cells were harvested at various time points or after 1 h to isolate total RNA or for preparation of protein extracts or cultured for 48 h for estimating IL-12 p40 and TNF-α levels in the culture supernatants by enzyme immunoassay (EIA). The IL-12 p40 and TNF-α cytokines (BD Pharmingen, San Diego, CA) in the macrophage culture supernatants were quantified by two-site sandwich EIA as described earlier (43). Standard curves for these cytokines were obtained using recombinant standard proteins provided along with the kits. RT-PCR was carried out as described elsewhere (24) using a forward primer (5′-ATGGTCACCCACAGCAAGTTT-3′) and a reverse primer (5′- TCACTGGATGCGCAGGTTC-3′) specific to SOCS3 (44). The amplification conditions for SOCS3 and β-actin were as follows: denaturation at 94°C for 30 s, annealing at 58°C for 1 min, and extension at 72°C for 2 min. After 30 cycles, the amplified products SOCS3 (293 bp) and β-actin (510 bp) were resolved by electrophoresis on 1.2% agarose gels and visualized by ethidium bromide staining. The amount of phosphorylated IκBα in macrophages was measured by flow cytometry as described elsewhere (24, 45) using rabbit anti–phospho-IκBα Ab (Cell Signaling Technology, Danvers, MA) followed by incubation with anti-rabbit–FITC conjugate (Sigma-Aldrich). The amount of phosphorylated Src was detected using mouse anti–phospho-Src (Tyr416) (Millipore, Temecula, CA) and detected with anti-mouse-FITC conjugate (Sigma-Aldrich). Flow cytometric analysis of the FITC-stained cells was carried out on a BD FACSVantage SE flow cytometer (BD Biosciences). PMA-differentiated macrophages were transfected with a Socs3-overexpressing construct (pCDNA-myc/SOCS3, a kind gift from Prof. K.N. Balaji, Indian Institute of Science, Bangalore, India) using Lipofectamine 2000 (Invitrogen). The expression vector without any insert (pCDNA/myc) was used as a negative control. After 36 h of transfection, cells were harvested and lysed to prepare total protein extracts. 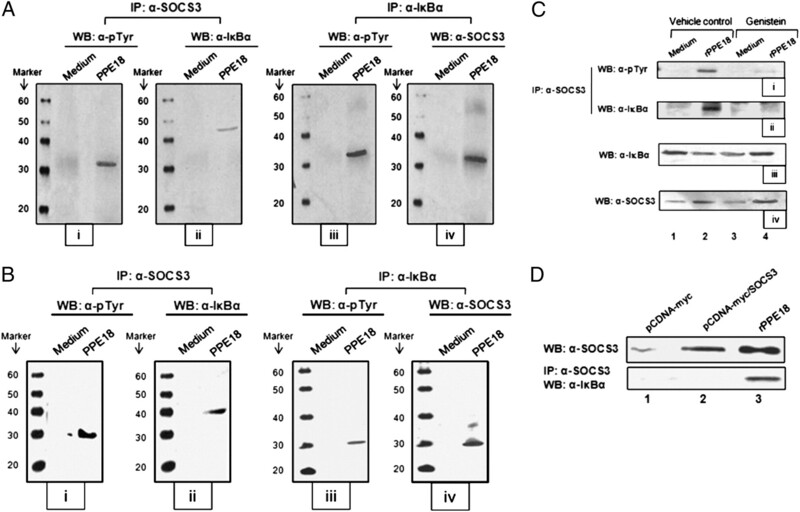 The expression of SOCS3 protein was determined by Western blotting using anti-SOCS3 Ab. Nuclear extracts and cytoplasmic extracts were prepared as described earlier (46, 47). Equal amounts of cytoplasmic or nuclear extracts from various groups were separated by 12% SDS-PAGE. The p50, p65, and c-rel levels were measured in both cytoplasmic and nuclear extracts, whereas total IκBα level was determined in cytoplasmic extracts. Following electrophoretic transfer, the nitrocellulose membranes were incubated with rabbit Ab to p50, p65, c-rel, or IκBα protein (Santa Cruz Biotechnology, Santa Cruz, CA). The membranes were next incubated with anti-rabbit Ig-HRP conjugate (Sigma-Aldrich). Bound reporter enzyme was detected by ECL kit following the manufacturer’s protocol (ECL; GE Healthcare, Little Chalfont, U.K.). In some experiments, equal loading of protein was confirmed by measuring the β-actin level in the same extracts by Western blotting. Nuclear extracts (10 μg) prepared from various experimental groups were incubated for 30 min at room temperature with 1 ng [32P] end-labeled duplex oligodeoxyribonucleotide containing the NF-κB binding region, (5′-TTGTTACAAGGGACTTTCCGCTGGGGACTTTCCAGGGAGGCGTGG-3′ and 5′-CCACGCCTCCCTGGAAAGTCCCCAGCGGAAAGTCCCTTGTAACAA-3′), and EMSA was performed as described earlier (41). To determine the NF-κB activity in various experimental groups, we used a luciferase NF-κB reporter construct. The pSV–β-galactosidase plasmid (Promega) was used to normalize transfection efficiency. The PMA-differentiated THP-1 macrophages were cotransfected with either 3xIgκ-ConA-Luc (NF-κB–luciferase reporter plasmid) and pSV–β-galactosidase plasmid or pConA (vector control) and pSV–β-galactosidase plasmid using Lipofectamine 2000 reagent (Invitrogen). After 24 h of transfection, cells were either left untreated or pretreated with rPPE18 (3 μg/ml) for 1 h followed by stimulation with LPS (3 μg/ml) for another 1 h. Cells were lysed and assayed for luciferase activity using luciferase reporter assay system according to the instructions of the manufacturer (Promega), and luciferase activity was monitored with a luminometer (Turner Designs, Sunnyvale, CA). The β-galactosidase expression was measured by β-galactosidase ELISA as per the manufacturer’s protocol (Roche Diagnostics). Luciferase activity values were normalized to transfection efficiency measured by β-galactosidase assay (Roche Diagnostics). The results are expressed as relative NF-κB activity of the test samples compared with that of the pConA-transfected samples after normalizing for β-galactosidase activity and protein concentration. For generating small interfering RNA (siRNA), primers were designed as follows: 5′-ATCCGCCAAGAACCTGCGCATCCATTCAAGGAGATGGATGCGCAGGTTCTTGGTTTTTG-3′ and 5′-AATTCAAAAAACCAAGAACCTGCGCATCCATCTCCTTGAATGGATGCGCAGGTTCTTGGCG-3′, and scramble oligonucleotides were used from custom SMARTPools from Dharmacon (Lafayette, CO). These oligonucleotides were annealed and ligated into pSIREN plasmid in BamH1 and EcoR1 sites and confirmed by sequencing. These constructs were used to transfect PMA-differentiated THP-1 macrophages using Lipofectamine 2000 reagent (Invitrogen). IκB kinase (IKK) activity was measured using the IKK-β inhibitor screening kit (Merck-Calbiochem). Approximately 100 ng GST-IκBα substrate was incubated with either 5 ng human rIKK-β (provided by the manufacturer) or IKK-α/β was pulled down from macrophage lysates (500 μg) using rabbit anti–IKK-α/β Ab (2 μg) (Santa Cruz Biotechnology) bound to the protein G-Sepharose beads (Sigma-Aldrich). In some wells, specific IKK-β inhibitor (provided by the manufacturer) was added. The reaction mixtures (10 μl) were added to wells precoated with glutathione to allow capture of GST-IκBα. The phosphorylated GST-IκBα substrate was detected using the mouse anti–phospho-IκBα (serine 32/36) Ab, followed by incubation with the anti-mouse IgG-HRP conjugate (Sigma-Aldrich). The HRP activity was measured using TMB substrate following the manufacturer’s protocol. The absorbance was measured at 450 nm and is directly related to the level of IKK activity. PMA-differentiated THP-1 macrophages were treated with 3 μg/ml rPPE18 in the absence or presence of LPS (3 μg/ml). Whole-cell extracts were prepared by using lysis buffer as described earlier (42). The coimmunoprecipitated proteins were detected by Western blotting using appropriate combinations of primary and secondary Abs. Data were expressed as mean ± SD of three independent experiments performed with similar results. The data were analyzed using Student t test wherever applicable. A p value < 0.05 was considered to be significant. The purified rPPE18 protein of M. tuberculosis was found to inhibit LPS-induced proinflammatory cytokines like TNF-α and IL-12 p40 in a dose-dependent manner (Supplemental Fig. 1A). The concentrations at which rPPE18 inhibited TNF-α and IL-12 p40 IC50 were found to be 292 ng/ml ± 64.2 (7.49 pM) and 257.8 ng/ml ± 21.4 (6.59 pM), respectively. Although the degree of inhibition was maximal in the range of 1–10 μg/ml, for all of our subsequent experiments, we used a concentration of 3 μg/ml to take care of batch-to-batch qualitative variations of the purified recombinant protein. We also observed that PPE18 at 3 μg/ml concentrations could inhibit early induction of TNF-α and IL-12 p40 in LPS-activated macrophages (Supplemental Fig. 1B). The NF-κB transcription factors are known to play critical roles in the induction of proinflammatory cytokines (48, 49), as the promoters of IL-12 p40 (50, 51) and TNF-α (52) contain NF-κB binding sites, and transcription of these genes is essentially dependent on binding of NF-κB/rel transcription factors to these sites. Therefore, we measured if NF-κB activity was lower in LPS-treated macrophages in the presence of rPPE18 using a luciferase reporter construct. The PMA-differentiated THP-1 macrophages were transiently cotransfected with the NF-κB luciferase plasmid along with a β-galactosidase reporter construct driven by a constitutive promoter to normalize the luciferase activity. At 24 h posttransfection, these macrophages were stimulated with 3 μg/ml LPS in the absence or presence of 3 μg/ml rPPE18 protein. To our expectation, the rPPE18 protein was found to attenuate LPS-stimulated NF-κB activity (Fig. 1A) by ∼2-fold. To further verify these observations, we measured the cognate DNA-binding activity of NF-κB by EMSA. The PMA-differentiated THP-1 macrophages were preincubated with either medium alone or rPPE18 protein and then stimulated with LPS. Nuclear extracts were prepared, and the DNA-binding activity of NF-κB was determined by EMSA using duplex oligonucleotides containing NF-κB binding sites. DNA-binding activity of NF-κB was found to be low in unstimulated macrophages or treated with rPPE18 alone (Fig. 1B, lanes 2 and 4). The DNA-binding activity of NF-κB was found to be highest in macrophages stimulated with LPS; however, the complex formation was markedly reduced in LPS-stimulated cells treated with rPPE18 (Fig. 1B, compare lane 5 with lane 3). The specificity of the NF-κB complex was confirmed by the competition assay using unlabeled NF-κB (Fig. 1B, lane 6). LPS-induced NF-κB activity is inhibited by rPPE18 in THP-1 macrophages. A, PMA-differentiated THP-1 macrophages were transfected with either the vector control alone (pConA) or the NF-κB luciferase reporter plasmid (3xIgκ-ConA-Luc) along with pSV–β-galactosidase plasmid. After 24 h, the macrophages were treated for 1 h with either medium or rPPE18 (3 μg/ml) and then stimulated with LPS (3 μg/ml) for another 1 h. Transcriptional activity of NF-κB was measured by luciferase and β-galactosidase assays. Data are shown as fold inductions over basal activity and represented as mean ± SD of three independent experiments performed in triplicate. B, Nuclear extracts prepared from PMA-differentiated THP-1 macrophages activated with LPS (3 μg/ml) in the absence or presence of rPPE18 (3 μg/ml) were subjected to EMSA. The data shown are representative of three independent experiments with similar results. The p50 and p65 NF-κB and c-rel are important transcription factors that are known to regulate IL-12 p40 gene transcription (50, 51, 53) as well as induction of TNF-α (52, 54). Because PPE18 was found to inhibit NF-κB activity in LPS-stimulated macrophages (Fig. 1), we next examined the nuclear levels of p50, p65, and c-rel transcription factors in these macrophages by Western blotting using specific Abs against these transcription factors. The Western blot results indicate that nuclear levels of all of these NF-κB/rel transcription factors are reduced in macrophages cotreated with rPPE18 and LPS as compared with the macrophages treated with LPS alone (Fig. 2A, bottom panel, compare lane 4 with lane 2). In contrast, the levels of p50, p65, and c-rel factors were higher in cytoplasm in the groups cotreated with rPPE18 and LPS as compared with the group treated with LPS alone (Fig. 2A, top panel, compare lane 4 with lane 2), indicating that PPE18 protein probably inhibits the translocation of NF-κB/rel transcription factors from cytoplasm to nucleus. Densitometric analyses were also carried out using AlphaEaseFC software and the Spot Denso tool (Version 7.0.1; Alpha Innotech, San Leandro, CA), and the mean intensity of the bands was presented as arbitrary unit in a graph (Fig. 2B). PPE18 protein abrogates cytonuclear translocation of NF-κB/rel subunits in macrophages treated with LPS. A, Cytoplasmic (CE) and nuclear (NE) extracts were prepared from PMA-differentiated THP-1 macrophages treated with LPS (3 μg/ml) without or with rPPE18 (3 μg/ml), and levels of p50, p65, and c-rel transcription factors were measured by Western blotting using anti-p50, anti-p65, or anti–c-rel Ab, respectively. Data are representative of three independent experiments with similar results. B, Graph representing densitometric analysis of blots represented in A. Mean intensity is expressed as arbitrary units of three independent experiments. The NF-κB transcription factors are shown to be controlled upstream by the cytoplasmic inhibitory protein known as IκBα (55–57). IκBα interacts and sequesters p50 and p65 NF-κB and c-rel proteins in the cytoplasm and prevents nuclear translocation of p50 and p65 NF-κB and c-rel proteins from cytoplasm (57). During macrophage activation, phosphorylation of IκBα at serine 32 and 36 residues by the IKKs marks it for degradation via ubiquitination and consequently releases the NF-κB/rel transcription factors to translocate to the nucleus, where they activate transcription of the target genes. Because PPE18 is able to inhibit LPS-induced NF-κB activity by inhibiting nuclear translocation of p50 and p65 NF-κB and c-rel transcription factors (Figs. 1, 2), we next determined whether PPE18 inhibits IκBα phosphorylation, which is a crucial event for NF-κB translocation and subsequent activation of target genes. It was found that LPS-induced IκBα phosphorylation was significantly inhibited in the presence of rPPE18 (Fig. 3A). This was well correlated with the observation that IκBα was poorly degraded in the rPPE18 and LPS cotreated group compared with the group treated with LPS alone (Fig. 3B, compare lane 4 with lane 2). 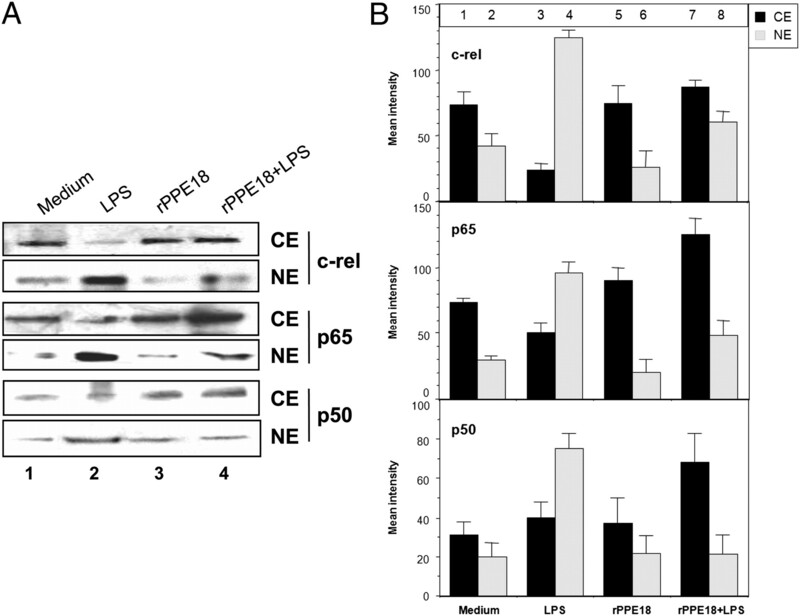 These results indicate that PPE18 affects LPS-induced phosphorylation and degradation of IκBα. rPPE18 protein inhibits LPS-induced phosphorylation of IκBα without affecting IKK-β activity. A, PMA-differentiated THP-1 macrophages were stimulated with LPS (3 μg/ml) in the absence or presence of rPPE18 (3 μg/ml). The phosphorylation of IκBα in various groups at the 15-min time point was analyzed by flow cytometry. B, Total IκBα levels in the cytoplasmic extracts were detected by Western blotting using anti-IκBα Ab. C, Whole-cell extracts were prepared from PMA-differentiated THP-1 macrophages treated with either medium or rPPE18 (3 μg/ml). Equal amounts of total proteins (500 μg) were used to immunoprecipitate IKK-α/β using anti–IKK-α/β bound to protein G-Sepharose beads, and the immunoprecipitated IKK-α/β was used to assess IκBα phosphorylation (mean ± SD) in the absence or presence of IKK-β inhibitor (provided by the manufacturer) as described in the Materials and Methods. In the positive control, GST-IκBα was incubated with the rIKK-β in the presence of medium alone (lane 2), and the specificity of the assay in lane 2 was confirmed by adding specific IKK-β inhibitor (lane 3). In negative control group, no IKK-β was added (lane 1). Data are representative of three independent experiments with similar results. Because the IKKs, notably IKK-α and IKK-β, are involved in signal-induced phosphorylation of IκBα (58, 59), experiments were carried out to explore if PPE18 inhibits IκBα phosphorylation by affecting the IKK-α/β activity. Therefore, we pulled down IKK-α and IKK-β from the cell extracts treated with rPPE18 using a rabbit polyclonal anti–IKK-α/β Ab and then measured its ability to phosphorylate GST-IκBα substrate in vitro. We found that in the presence of the IKK-β inhibitor, the phosphorylation status of the GST-IκBα substrate is reduced (Fig. 3C, compare lane 7 with lane 6) to almost the negative control levels (Fig. 3C, lane 1). These data indicate that IKK-β is predominantly involved in the signal-induced phosphorylation of IκBα in these cells. We observed that PPE18 did not affect the IKK-β activity (Fig. 3C) because there was no difference in the ability of IKK-β to phosphorylate GST-IκBα in the absence (Fig. 3C, lane 4) or presence (Fig. 3C, lane 6) of rPPE18. Because mycobacteria are known to increase the levels of SOCS3 proteins (31, 32), and several studies have implicated a role of SOCS3 in attenuation of proinflammatory signaling (25–28), we speculated a role of SOCS3 in the observed PPE18-mediated downregulation of proinflammatory response. Interestingly, an increase in the SOCS3 mRNA level was observed as early as 1 h after treatment with rPPE18 (3 μg/ml), and this expression was sustained until 24 h posttreatment (Fig. 4A). The SOCS3 mRNA levels were increased by rPPE18 in a dose-dependent manner (Fig. 4B). The mRNA levels of SOCS3 were also found to be well correlated with the levels of SOCS3 protein (Fig. 4C). We also examined whether PPE18 could increase SOCS3 expression when presented in the context of whole bacterium using an M. smegmatis (that naturally lacks the PPE18 gene) overexpressing PPE18 (M. smegmatis–pMV-PPE18) (24). Interestingly, there was a significant increase in the SOCS3 expression in macrophages infected with M. smegmatis–pMV-PPE18 as compared with the macrophages infected with M. smegmatis harboring the pMV261 vector alone (M. smegmatis-pMV) (Fig. 4D). rPPE18 protein increases SOCS3 levels in THP-1 macrophages. 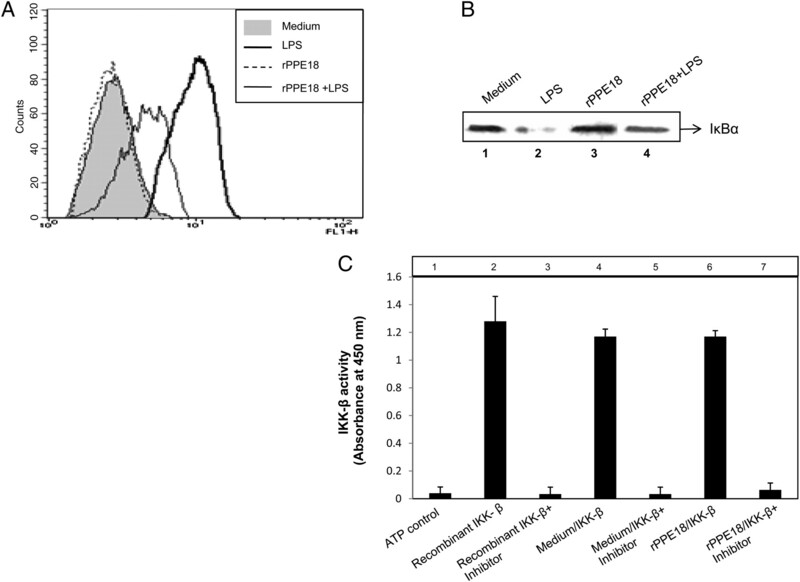 PMA-differentiated THP-1 macrophages were either treated with a fixed concentration (3 μg/ml) of rPPE18 for various time points (A) or with different concentrations of rPPE18 protein for a fixed time of 2 h (B). LPS (3 μg/ml for 2 h) was added as a positive control. RNAs from all these groups were extracted and subjected to semiquantitative RT-PCR for SOCS3. SOCS3 levels induced by different concentrations of rPPE18 were also checked by Western blot analysis using anti-SOCS3 Ab (C). SOCS3 expression at different time points was checked in PMA-differentiated THP-1 macrophages infected with either M. smegmatis strain overexpressing PPE18 (M. smegmatis-pMV-PPE18) or M. smegmatis harboring the vector alone (M. smegmatis-pMV) at multiplicity of infection of 10 (D). Data are representative of three to four independent experiments with similar results. Because we found that PPE18 could increase SOCS3 levels and inhibit LPS-induced IκBα phosphorylation, we predicted that PPE18 probably targets the SOCS3 protein to inhibit LPS-induced IκBα phosphorylation and translocation of NF-κB subunits into the nucleus and thereby suppresses induction of proinflammatory cytokines. To validate this hypothesis, we suppressed SOCS3 expression by using SOCS3-specific siRNA and examined the effect of PPE18 on IκBα phosphorylation and NF-κB activity in LPS-treated THP-1 macrophages. The nuclear levels of p65 NF-κB and c-rel and induction of IL-12 p40 and TNF-α were also determined. The PMA-differentiated THP-1 macrophages were transfected with either the scrambled siRNA (THP-1 control group) or SOCS3-specific siRNA (THP-1–SOCS3i group), and after 24 h posttransfection, these macrophages were stimulated with 3 μg/ml LPS in the absence or presence of 3 μg/ml rPPE18. Depletion of SOCS3 mRNA levels by siRNA was verified by semiquantitative RT-PCR as well as by Western blotting at the protein level (Supplemental Fig. 2A, 2B). Silencing of endogenous SOCS3 was found to rescue PPE18-mediated inhibition of IκBα phosphorylation in LPS-stimulated THP-1 macrophages (Fig. 5A). Concomitantly, an increase in the NF-κB activity was also observed in the THP-1–SOCS3i group as compared with the THP-1 control group (Supplemental Fig. 3). As expected, a simultaneous upregulation in the nuclear p65 and c-rel levels in response to LPS activation was also observed in THP-1–SOCS3i macrophages in the presence of rPPE18 as compared with that of THP-1 control macrophages (Fig. 5B). Depletion of SOCS3 also reversed the PPE18-mediated inhibition of IL-12 p40 and TNF-α induction in these macrophages (Fig. 5C, compare bar 8 with bar 4; p < 0.001 in both the cases). Further, these results also hint to an additional signaling pathway regulating the induction of proinflammatory cytokines (IL-12 p40 and TNF-α) via the SOCS3 signaling pathway. To further substantiate our observation in PMA-differentiated THP-1 macrophages that PPE18 targets the SOCS3 to inhibit nuclear translocation of NF-κB/rel subunits and consequently inhibits proinflammatory cytokines in LPS-treated macrophages, these experiments were also carried out in human MDMs. Depletion of endogenous SOCS3 by siRNA in MDMs resulted in upregulation of the levels of LPS-induced nuclear c-rel and p65 as compared with the group that received the scrambled siRNA (Fig. 5D). This was correlated with concomitant increase of IL-12 p40 and TNF-α induction in these cells (Fig. 5E, compare bar 8 with bar 4; p < 0.001 in both the cases). It will be pertinent to mention in this study that the SOCS3-deficient mice are embryonically lethal (60); therefore, the role of SOCS3 in the regulation of macrophage response is most widely studied using SOCS3-specific siRNA construct to knockdown its expression in vitro (25, 33). Because PPE18 targets the SOCS3 protein to suppress LPS-induced proinflammatory responses, our next aim was to decode the possible mechanism(s) by which PPE18 elicits such an anti-inflammatory response involving SOCS3. In this regard, two possible mechanisms can be envisioned. First, the SOCS3 may inhibit the IKK-β activity or alternatively may physically interact with the IκBα–NF-κB/rel complex in the cytoplasm. Because we found earlier that SOCS3 does not affect the IKK-β activity (Fig. 3C), we speculated that SOCS3 probably interacts with the IκBα–NF-κB complex physically and thereby prevents IKK-β to access the phosphorylation sites on IκBα. To validate this premise, we first coimmunoprecipitated SOCS3-interacting protein(s) using anti-SOCS3 Ab from the extracts prepared from the rPPE18-treated THP-1 macrophages and then subjected to Western blotting using anti-IκBα Ab as well as Abs to p50, p65, and c-rel transcription factors. Intriguingly, we found that IκBα along with p50, p65, and c-rel transcription factors could be coimmunoprecipitated using anti-SOCS3 Ab (Fig. 6Ai). Similar results were also obtained in human MDMs (Fig. 6Aii), indicating that SOCS3 probably interacts physically with the IκBα–NF-κB/rel complex. Reciprocal coimmunoprecipitation experiments were carried out by coimmunoprecipitating cell extracts prepared from rPPE18-treated THP-1 macrophages using Ab to p50, p65, c-rel, or IκBα followed by Western blotting using anti-SOCS3 Ab. In all of the cases, we found that SOCS3 could be coimmunoprecipitated along with p50, p65, c-rel, and IκBα, respectively (Fig. 6B, upper panel). As input controls, the levels of p50, p65, c-rel, and IκBα in the cell extracts from medium and PPE18-treated macrophages were determined by immunoblotting with appropriate combinations of primary and secondary Ab (Fig. 6B, lower panel). These data indicate that SOCS3 physically interacts with the IκBα–NF-κB/rel complex that prevents IκBα phosphorylation and its subsequent degradation. These data suggest a novel mechanism by which SOCS3 can participate in the regulation of NF-κB/rel–mediated signaling cascades. SOCS3 physically interacts with IκBα–NF-κB/rel complex. A, The PMA-differentiated THP-1 macrophages (i) or human MDMs were treated with either medium or rPPE18 (ii) (3 μg/ml). After 1 h, cells were harvested, and whole-cell lysates were prepared. Cell lysates were immunoprecipitated (IP) with goat anti-SOCS3 Ab, and precipitates were immunoblotted with rabbit anti-p50, anti-p65, anti–c-rel, or anti-IκBα Ab. The total SOCS3 level in the whole-cell lysates was checked by immunoblotting (WB) using goat anti-SOCS3 Ab. B, Reciprocal coimmunoprecipitation experiments were carried out wherein whole-cell lysates from the PMA-differentiated THP-1 macrophages treated with either medium alone or rPPE18 (3 μg/ml) were immunoprecipitated with rabbit anti-p50, anti-p65, anti–c-rel, or anti-IκBα Ab and immunoblotted using goat anti-SOCS3Ab. As input controls, the levels of p50, p65, c-rel, and IκBα in the cell extracts from medium, and PPE18-treated macrophages were determined by immunoblotting with appropriate combinations of primary and secondary Ab. Blots are representative of three to four independent experiments with similar results. Because tyrosine phosphorylation of SOCS3 has been shown to be important for its various interactions with target proteins (61–64), we evaluated if the observed interaction of SOCS3 with IκBα is due to the phosphorylation of either SOCS3 or IκBα by PPE18. Therefore, extracts prepared from rPPE18-treated macrophages were immunoprecipitated with anti-SOCS3 Ab and probed with anti-phosphotyrosine Ab. Interestingly, only a single band corresponding to the expected molecular mass of SOCS3 (30 kDa) was observed (Fig. 7Ai); however, no band corresponding to the molecular mass of IκBα (41 kDa) was detectable (Fig. 7Ai). In contrast, when the same blot was stripped and reprobed with anti-IκBα Ab, a band corresponding to the expected molecular mass of IκBα was observed (Fig. 7Aii), indicating that IκBα that interacts with SOCS3 is not tyrosine phosphorylated by PPE18, and PPE18 predominantly phosphorylates the tyrosine residue(s) of SOCS3. In another experiment, the same extract was immunoprecipitated with anti-IκBα Ab and probed with either anti-phosphotyrosine Ab (Fig. 7Aiii) or anti-SOCS3 Ab (Fig. 7Aiv). In line with our earlier observation, tyrosine phosphorylation was only detected in SOCS3 but not in IκBα (Fig. 7Aiii, iv). Comparable results were also obtained in human MDMs (Fig. 7Bi–iv). These results suggest that rPPE18 not only increases the expression of SOCS3 but also triggers tyrosine phosphorylation of SOCS3, which in turn interacts with IκBα. When the phosphorylation status of the immunoprecipitated SOCS3 was assessed in THP-1 macrophages treated with various concentrations of rPPE18, a dose-dependent increase in tyrosine phosphorylation in addition to upregulation of SOCS3 protein expression was observed (Supplemental Fig. 4). To further address whether tyrosine phosphorylation of SOCS3 is essential for its interaction with IκBα–NF-κB/rel complex, we preincubated THP-1 macrophages with genistein (a known inhibitor of tyrosine phosphorylation) and then incubated with 3 μg/ml rPPE18 and examined SOCS3–IκBα interaction by coimmunoprecipitation. We observed that genistein prevented tyrosine phosphorylation of SOCS3 in rPPE18-treated macrophages (Fig. 7Ci, compare lane 4 with lane 2), and no IκBα could be immunoprecipitated using anti-SOCS3 Ab when these macrophages were treated with rPPE18 in the presence of genistein (Fig. 7Cii, compare lane 4 with lane 2). Genistein treatment had no direct effect on the total IκBα levels (Fig. 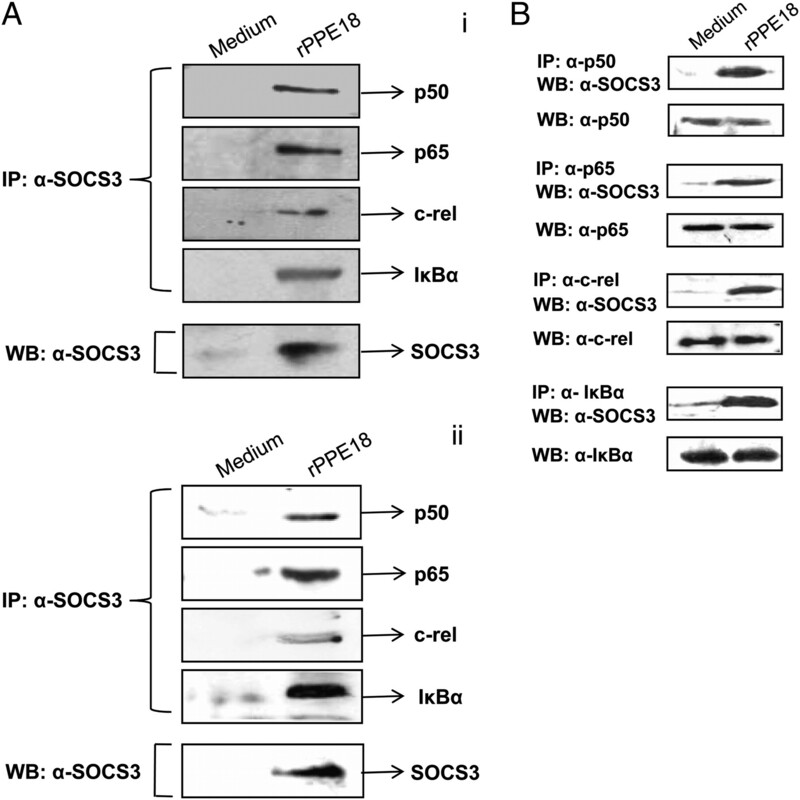 7Ciii) or on the SOCS3 induction by rPPE18 (Fig. 7Civ). These results indicate that tyrosine phosphorylation of SOCS3 is essential for its physical interaction with IκBα. To further substantiate this observation, SOCS3 protein was transiently overexpressed by transfecting THP-1 macrophages with SOCS3 overexpression plasmid (pCDNA-myc/SOCS3) and examined whether constitutively expressed SOCS3 could also interact in vivo with IκBα–NF-κB/rel complex. THP-1 macrophages transfected with the backbone vector (pCDNA-myc) served as the negative control group. In the positive control group, THP-1 macrophages were treated with rPPE18 (3 μg/ml). The lysates prepared from these groups were used to immunoprecipitate the SOCS3–IκBα complex using anti-SOCS3 Ab. Although very high levels of SOCS3 were present in the THP-1 macrophages transfected with pCDNA-myc/SOCS3 (Fig. 7D, upper panel, lane 2), in the absence of rPPE18, no IκBα bound to SOCS3 could be immunoprecipitated with anti-SOCS3 Ab (Fig. 7D, lower panel, lane 2). However, in the presence of rPPE18, IκBα was immunoprecipitated using the same amount of anti-SOCS3 Ab (Fig. 7D, lower panel, lane 3). These results clearly indicate that IκBα does not interact with the SOCS3 that is not tyrosine phosphorylated. Because our earlier studies revealed that the N-terminal domain of PPE18 is primarily responsible for its interaction with TLR2 (24), we next investigated the domain of PPE18 involved in mediating tyrosine phosphorylation SOCS3. The THP-1 macrophages were treated with the full-length or N-terminal truncated or C-terminal truncated PPE18 protein and checked for tyrosine phosphorylation of SOCS3. The coimmunoprecipitation data indicate that the C-terminal truncated PPE18 could induce SOCS3 tyrosine phosphorylation as efficiently as the full-length PPE18 protein, whereas no SOCS3 tyrosine phosphorylation could be detected in macrophages treated with N-terminal truncated PPE18 protein. These data indicate that the N-terminal domain of PPE18 is important in mediating tyrosine phosphorylation of SOCS3 (Supplemental Fig. 5). rPPE18 induces SOCS3 tyrosine phosphorylation, and tyrosine-phosphorylated SOCS3 interacts with IκBα–NF-κB/rel complex. PMA-differentiated THP-1 macrophages (A) or human MDMs (B) were treated with 3 μg/ml of rPPE18 for 1 h. The cell lysates were immunoprecipitated (IP) with either goat anti-SOCS3 Ab (i, ii) or rabbit anti-IκBα Ab (iii, iv), and the precipitates were immunoblotted (WB) with either mouse anti-phosphotyrosine Ab (i, iii), rabbit anti-IκBα Ab (ii), or with goat anti-SOCS3 Ab (iv). C, In another experiment, PMA-differentiated THP-1 macrophages were treated with 3 μg/ml rPPE18 in the presence of vehicle control (DMSO) or genistein (100 μM). After 1 h, cells were harvested, and whole-cell lysates were prepared. The lysates were immunoprecipitated with anti-SOCS3 Ab and then immunoblotted with either anti-IκBα Ab (i) or anti-phosphotyrosine Ab (ii). The lysates were also probed with either anti-SOCS3 Ab (iii) or anti-IκBα Ab (iv) to detect the total levels of SOCS3 and IκBα. D, The PMA-differentiated THP-1 macrophages were transiently transfected with either vector control alone (pCDNA) or SOCS3-overexpression plasmid (pCDNA-myc/SOCS3), and after 36 h, cell lysates were prepared. Also, PMA-differentiated THP-1 macrophages were treated with 3 μg/ml rPPE18 for 1 h, and cell lysates were prepared. The cell lysates were either blotted for SOCS3 (top panel) or immunoprecipitated with anti-SOCS3 Ab and then blotted for IκBα (bottom panel). Data are representative of three independent experiments with similar results. Several reports have implicated a prominent role of p38 MAPK signaling in SOCS3 induction (32, 65–67). In our previous study, we found that PPE18 induces early activation of p38 MAPK, which is in turn necessary for the IL-10 induction via TLR2 (24). In light of these observations, it was interesting to investigate the importance of p38 MAPK in PPE18-mediated SOCS3 expression. Therefore, we pretreated THP-1 macrophages with SB203580 (2.5 and 5 μg/ml concentration), a specific inhibitor of the p38 MAPK pathway (24), before exposing them to rPPE18, and SOCS3 mRNA expression was measured by semiquantitative RT-PCR. We found that SB203580 decreased SOCS3 gene expression in PPE18-treated macrophages in a concentration-dependent manner (Fig. 8A). 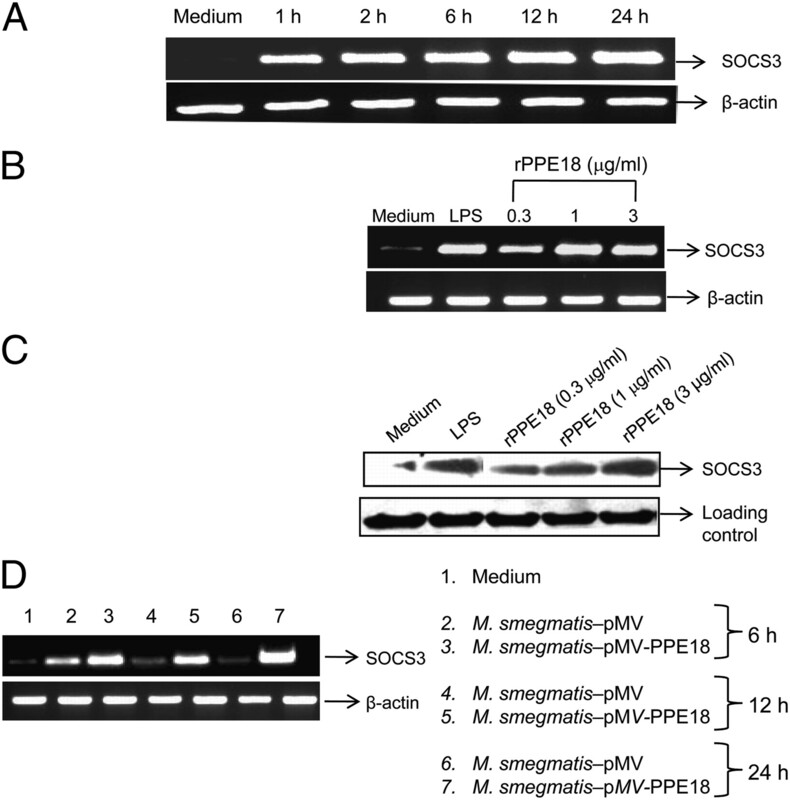 These results suggest the fact that induction of SOCS3 by PPE18 probably depends on its activation of the upstream p38 MAPK. rPPE18 induces expression and its tyrosine phosphorylation of SOCS3 through activation of p38 MAPK and Src PTKs, respectively. A, The PMA-differentiated THP-1 macrophages were pretreated with 2.5 or 5 μg/ml SB203580 for 1 h followed by incubation with 3 μg/ml rPPE18. After 1 h, cells were harvested, and SOCS3 mRNA expression was estimated by semiquantitative RT-PCR as described in the Materials and Methods. The mRNA levels were normalized to β-actin mRNA levels. B, Phosphorylation status of Src PTKs in PMA-differentiated THP-1 macrophages on treatment with rPPE18 was monitored by flow cytometry at indicated time points. C, The rPPE18-induced tyrosine phosphorylation of SOCS3 was assessed in PMA-differentiated THP-1 macrophages pretreated for 1 h with PP2 (5 and 10 μM), SU6656 (5 and 10 μM), or Src inhibitor-1 (1 and 5 μM). The cell lysates were immunoprecipitated (IP) with goat anti-SOCS3 Ab, and then immunoblotted (WB) with mouse anti-phosphotyrosine Ab. Data are representative of three independent experiments with similar results. To understand the mechanism through which PPE18 could also induce tyrosine phosphorylation of SOCS3, we evaluated the role of protein tyrosine kinases (PTKs), especially the Src family tyrosine kinases. Increasing evidence suggests that members of the Src family of PTKs play important roles in tyrosine phosphorylation of SOCS3 (68, 69). Therefore, we first investigated whether Src PTKs are activated in the macrophages that were treated with rPPE18 by analyzing the Src PTKs phosphorylation status using the anti–phospho-Src family Ab (p-Tyr416). It has been shown that Tyr416 residue of Src can be phosphorylated, and this is important for upregulation of Src kinase activity (70). Therefore, we examined whether PPE18 can induce Src kinase activity in THP-1 macrophages by assessing the phosphorylaton status of Src kinase by flow cytometry. We found that Src got phosphorylated in PPE18-treated THP-1 macrophages as early as 15 min and was increased up to 60 min (Fig. 8B). Next, we investigated whether Src kinase activation is required for tyrosine phosphorylation of SOCS3 in PPE18-treated THP-1 macrophages. We used known selective Src-family PTK inhibitors like PP2, SU6656, and Src inhibitor-1 (71–73). The THP-1 macrophages were pretreated with these inhibitors for 1 h and then treated with 3 μg/ml rPPE18, and SOCS3 tyrosine phosphorylation was examined. It was observed that PP2 (5 and 10 μM) as well as SU6656 (5 and 10 μM) and Src inhibitor-1 (1 and 5 μM) could inhibit PPE18-induced SOCS3 tyrosine phosphorylation (Fig. 8C). 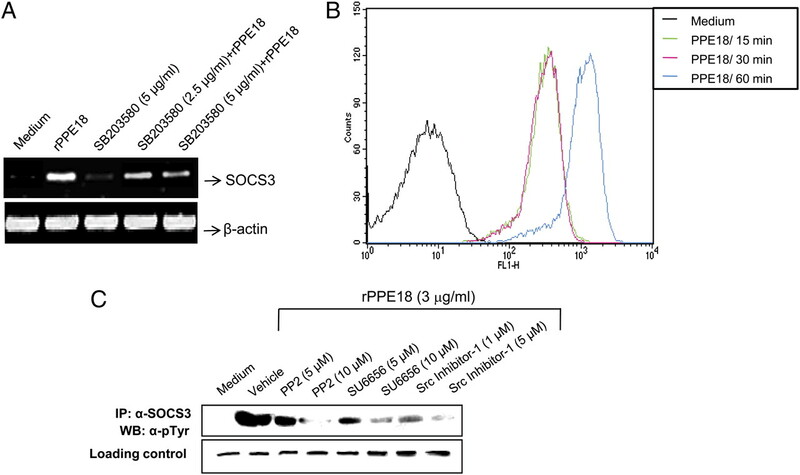 These results indicate a possible role of the Src family kinases in the PPE18-mediated tyrosine phosphorylation of SOCS3. Therefore, it appears that PPE18 induces SOCS3 expression by activating the p38 MAPK and SOCS3 phosphorylation by activating the Src kinases. During the innate phase of immune response, the macrophage-secreted cytokines IL-12 and TNF-α play major roles in the development of Th1 T cells and activation of cell-mediated immune responses (2, 3). These proinflammatory cytokines are vital components of the host defense in response to intracellular infection like tuberculosis and therefore are targeted at multiple points by the pathogenic mycobacteria to avoid immune-mediated clearance (9, 10). Thus, identification of hijacking points that prevent induction of these cytokines during mycobacterial infection is important to device an appropriate immune intervention to circumvent mycobacterial infection. The mycobacterial species are known to upregulate SOCS3 expression (31, 32), and SOCS3 has been shown to specifically inhibit signaling by IFN-γ, the IL-6 family of cytokines, and other molecules (27, 38, 74). Several groups have reported that mycobacterial infection could increase the levels of SOCS3 protein that inhibit IFN-γ–stimulated JAK/STAT signaling and consequently inhibit proinflammatory gene expression (31). Further, ectopic expression of SOCS3 in macrophage at physiological levels was also shown to suppress LPS-mediated TNF-α and CD40 expression (27, 75). Recently, SOCS3 has also been found to inhibit TNFR-associated factor 6 and TGF-β–activated kinase, both of which are crucial for TLR-driven proinflammatory responses (34). Owing to the importance of SOCS3 protein in the regulation of innate and adaptive immunity (26, 29, 35, 76), it is believed that the microorganisms may have evolved strategies to hijack the SOCS3 signaling system also for evasion of the host’s immune response. Even though mycobacteria species are suggested to trigger SOCS3 expression (25, 31, 32), the pathophysiological role of SOCS3 in tuberculosis is not well understood. In this study, we demonstrate that the PPE18 protein of M. tuberculosis, which is known to be expressed during infection (77), could also induce tyrosine phosphorylation of SOCS3, which was found to be essential for suppression of proinflammatory cytokine production in LPS-activated macrophages. We have shown earlier that the PPE18 protein specifically interacts with the LRR 11–15 domain of TLR2 and activates early induction of IL-10 in macrophages (24). Several studies demonstrated that IL-10 enhances SOCS3 expression (27, 78, 79). Thus, it is possible that IL-10 is involved in the increased production of SOCS3 by PPE18 that in turn blocks proinflammatory cytokine induction in LPS-activated macrophages. In addition, PPE18 can also target some other signaling pathways to trigger SOCS3 expression and its tyrosine phosphorylation. 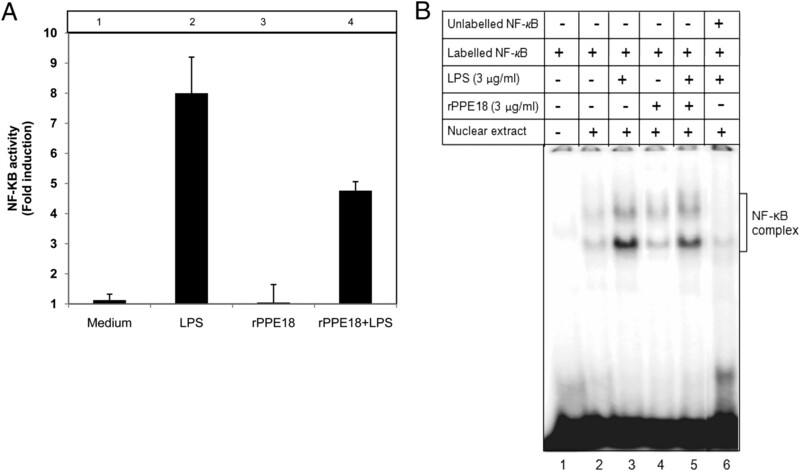 The PPE18 protein was found to inhibit LPS-mediated nuclear translocation of NF-κB/rel subunits recruiting the phosphorylated SOCS3 protein to the IκBα–NF-κB/rel complex. Silencing of SOCS3 gene expression by a specific siRNA abolished the inhibitory effect of PPE18 on NF-κB activity, indicating a role of SOCS3 in the regulation of NF-κB signaling. Phosphorylation of the IκBα proteins on N-terminal serine residues (serine 32/36) by IKK-α/β followed by its degradation is a critical process that regulates NF-κB activity (56, 57). IKK-β is found to be more proactive in phosphorylation of IκBα as compared with IKK-α and appears to be the most dominant kinase in regulating the phosphorylation of IκBα and therefore in regulating the NF-κB activity in our study as also reported by others (58, 80–82). The most interesting fact uncovered by our study is that a phosphorylated form of SOCS3 induced by the mycobacterial PPE protein (PPE18) physically interacts with IκBα–NF-κB/rel complex, which possibly masks the IKK-β substrate residues on IκBα and thereby sequesters NF-κB proteins in the cytosol but without affecting IKK-β activity per se. Although SOCS3 in the presence of rPPE18 could interact with the IκBα–NF-κB/rel complex, constitutive expression of SOCS3 protein in the macrophages was not sufficient to interact with the IκBα–NF-κB/rel complex. The apparent difference in binding of endogenous SOCS3 from SOCS3 induced by rPPE18 was attributed to increased tyrosine phosphorylation of SOCS3 induced by rPPE18. These observations suggest that phosphorylation of tyrosine residues on SOCS3 is essential for its ability to interact with the IκBα–NF-κB/rel complex. Further, we could not detect an interaction of SOCS3 with the IκBα–NF-κB/rel complex in the presence of LPS, though LPS is known to increase the levels of SOCS3, presumably because SOCS3 is not phosphorylated when stimulated with LPS alone (83) (Supplemental Fig. 6). Probably, this also explains why SOCS3 does not affect TNF-α secretion and NF-κB activity when macrophages are stimulated with LPS alone (35, 84). Phosphorylation of SOCS3 at the tyrosine residue(s) probably induces a conformational change in the SOCS3, which makes it capable of physically interacting with the IκBα–NF-κB/rel complex and sterically prevents IKK-β from accessing its substrate interface on IκBα. However, the mechanism(s) by which PPE18 induces tyrosine phosphorylation on SOCS3 remains to be investigated. Also, further studies are required to identify the SOCS3 domain that interacts with the IκBα–NF-κB/rel complex. SOCS3 is tyrosine-phosphorylated in response to a variety of stimuli (63, 68, 85), and tyrosine phosphorylation of SOCS3 is found to be important for its biological functions. The principal phosphorylation sites on SOCS3 are residues 204 and 221 at the C terminus. Studies indicate that tyrosine-phosphorylated SOCS3 interacts and inhibits JAK1 phosphorylation in T cells (63). Similarly, tyrosine-phosphorylated SOCS3 was also shown to interact with and prevent the function of the p120 RasGAP (64). Tyrosine-phosphorylated SOCS3 was also found to interact with Nck and Crk-L adapter proteins and regulate Nck activation (62). In this study, we report that a mycobacterial protein can upregulate SOCS3 expression as well as its tyrosine phosphorylation, and the phosphorylated SOCS3 then interacts with the IκBα–NF-κB/rel complex to inhibit phosphorylation of IκBα at the serine 32/36 residues by IKK-β in macrophages during stimulation with LPS, masking the IKK-β substrate site on IκBα possibly by steric hindrances that prevent IKK-β from accessing the serine 32/36 substrate sites on IκBα in the presence of phosphorylated SOCS3. This prevents nuclear translocation of NF-κB/rel subunits and induction of proinflammatory cytokine genes, mainly IL-12 and TNF-α, in activated macrophages. This study also hints to an existence of a novel mechanism of regulation of NF-κB/rel activity involving SOCS3 in addition to the classical IKK pathway (48, 56). There are several reports that have implicated p38 MAPK in playing a major role in induction of SOCS3 (32, 65–67). Because earlier we found that PPE18 interacts with the LRR 11–15 domain of TLR2 and leads to an early and sustained activation of p38 MAPK, which was critical for IL-10 induction (24), it was reasonable to expect that PPE18 increased the SOCS3 levels in THP-1 macrophages via activation of p38 MAPK. Indeed, PPE18-mediated activation of SOCS3 was inhibited in the presence of SB203580, a pharmacological inhibitor of p38 MAPK, indicating that p38 MAPK is probably involved in the increased induction of SOCS3 in macrophages treated with PPE18. Using specific Src PTK inhibitors, we provide evidence that Src PTKs, which we found to be active on treatment with PPE18, are involved in the tyrosine phosphorylation of SOCS3. Taken together, these results suggest that SOCS3 phosphorylation is an Src PTK-mediated phenomenon, but the role of other kinases cannot be ruled out. Therefore, it can be postulated that early activation of p38 MAPK may provide a pool of SOCS3, which can be rapidly phosphorylated by Src PTKs. Taken together, the study points toward a complex regulation of PPE18-induced SOCS3 by p38 MAPK, and SOCS3 phosphorylation by activating Src PTKs and the N-terminal domain of PPE18 was found to be important in mediating tyrosine phosphorylation of SOCS3. In summary, we describe a novel mechanism by which SOCS3 acts as a negative regulator of proinflammatory signaling. The data presented in this study provide an insight into the probable mechanism by which phosphorylated SOCS3 negatively regulates NF-κB–dependent proinflammatory cytokine gene expression. Although we identified the probable pathway in the context of understanding the anti-inflammatory mechanisms by a mycobacterial PPE18 protein, it is likely that this pathway has evolved to control overshooting of the host inflammatory responses when challenged by a pathogen. M. tuberculosis appears to hijack this pathway for a rapid shut down of the host’s protective inflammatory response to pave its way for efficient replication inside the host. It will be interesting to examine whether SOCS3 is phosphorylated by pathogenic mycobacteria that may highlight possible virulence mechanisms by which the pathogenic mycobacteria can suppress an incumbent proinflammatory responses mounted by the host upon infection. We thank Niteen Pathak for technical assistance in flow cytometry and Dr. Poongothai A. Ramaswamy for help in RT-PCR. This work was supported by a research fellowship from the Council of Scientific and Industrial Research, India (to S.N. ), grants from the Department of Biotechnology, Government of India, and a core grant to the Centre for DNA Fingerprinting and Diagnostics by the Department of Biotechnology.
. 1975. Phagosome-lysosome interactions in cultured macrophages infected with virulent tubercle bacilli. Reversal of the usual nonfusion pattern and observations on bacterial survival. J. Exp. Med. 142: 1–16.
. 1999. Cytokine/chemokine cascades in immunity to tuberculosis. Immunol. Today 20: 307–312.
. 2002. Innate immunity to Mycobacterium tuberculosis. Clin. Microbiol. Rev. 15: 294–309.
. 2002. Genetics, cytokines and human infectious disease: lessons from weakly pathogenic mycobacteria and salmonellae. Nat. Genet. 32: 97–105.
. 1996. Corynebacterium parvum- and Mycobacterium bovis bacillus Calmette-Guerin-induced granuloma formation is inhibited in TNF receptor I (TNF-RI) knockout mice and by treatment with soluble TNF-RI. J. Immunol. 157: 5022–5026.
. 2001. Infection of human macrophages and dendritic cells with Mycobacterium tuberculosis induces a differential cytokine gene expression that modulates T cell response. J. Immunol. 166: 7033–7041.
. 2002. Human macrophage activation programs induced by bacterial pathogens. Proc. Natl. Acad. Sci. USA 99: 1503–1508.
. 2004. Interplay between mycobacteria and host signalling pathways. Nat. Rev. Microbiol. 2: 189–202.
. 1994. Differential release of tumor necrosis factor-alpha from murine peritoneal macrophages stimulated with virulent and avirulent species of mycobacteria. FEMS Immunol. Med. Microbiol. 8: 225–232.
. 1994. Release of TNF α and IL6 from human monocytes infected with Mycobacterium kansasii: a comparison to Mycobacterium avium. Infection 22: 326–329.
. 1994. Induction of IL-1 β, IL-6, TNF-α, GM-CSF and G-CSF in human macrophages by smooth transparent and smooth opaque colonial variants of Mycobacterium avium. J. Med. Microbiol. 40: 129–133.
. 1998. Deciphering the biology of Mycobacterium tuberculosis from the complete genome sequence. Nature 393: 537–544.
. 2006. Evolution and expansion of the Mycobacterium tuberculosis PE and PPE multigene families and their association with the duplication of the ESAT-6 (esx) gene cluster regions. BMC Evol. Biol. 6: 95.
. 2004. Regulation of the Mycobacterium tuberculosis PE/PPE genes. Tuberculosis (Edinb.) 84: 256–262.
. 2002. The PE multigene family: a ‘molecular mantra’ for mycobacteria. Trends Microbiol. 10: 246–249.
. 2003. PPE antigen Rv2430c of Mycobacterium tuberculosis induces a strong B-cell response. Infect. Immun. 71: 6338–6343.
. 2008. Association of strong immune responses to PPE protein Rv1168c with active tuberculosis. Clin. Vaccine Immunol. 15: 974–980.
. 2000. Granuloma-specific expression of Mycobacterium virulence proteins from the glycine-rich PE-PGRS family. Science 288: 1436–1439.
. 2005. A Mycobacterium avium PPE gene is associated with the ability of the bacterium to grow in macrophages and virulence in mice. Cell. Microbiol. 7: 539–548.
. 2007. Execution of macrophage apoptosis by PE_PGRS33 of Mycobacterium tuberculosis is mediated by Toll-like receptor 2-dependent release of tumor necrosis factor-α. J. Biol. Chem. 282: 1039–1050.
. 2009. The PPE18 of Mycobacterium tuberculosis interacts with TLR2 and activates IL-10 induction in macrophage. J. Immunol. 183: 6269–6281.
. 2008. NOTCH1 up-regulation and signaling involved in Mycobacterium bovis BCG-induced SOCS3 expression in macrophages. J. Biol. Chem. 283: 12501–12511.
. 2002. Involvement of suppressor of cytokine signaling-3 as a mediator of the inhibitory effects of IL-10 on lipopolysaccharide-induced macrophage activation. J. Immunol. 168: 6404–6411.
. 2006. Divergent mechanisms utilized by SOCS3 to mediate interleukin-10 inhibition of tumor necrosis factor α and nitric oxide production by macrophages. J. Biol. Chem. 281: 6316–6324.
. 2004. Induction of suppressor of cytokine signaling-3 by herpes simplex virus type 1 contributes to inhibition of the interferon signaling pathway. J. Virol. 78: 6282–6286.
. 2005. Indispensable role of Stat5a in Stat6-independent Th2 cell differentiation and allergic airway inflammation. J. Immunol. 174: 3734–3740.
. 2003. Mycobacterium bovis bacillus Calmette-Guérin infection promotes SOCS induction and inhibits IFN-γ-stimulated JAK/STAT signaling in J774 macrophages. FEMS Immunol. Med. Microbiol. 39: 173–180.
. 2006. Mycobacterium avium-induced SOCS contributes to resistance to IFN-γ-mediated mycobactericidal activity in human macrophages. J. Leukoc. Biol. 80: 1136–1144.
. 2008. SOCS3 promotes TLR4 response in macrophages by feedback inhibiting TGF-β1/Smad3 signaling. Mol. Immunol. 45: 1405–1413.
. 2006. Suppressor of cytokine Signaling-3 inhibits interleukin-1 signaling by targeting the TRAF-6/TAK1 complex. Mol. Endocrinol. 20: 1587–1596.
. 2003. SOCS-3 regulates onset and maintenance of T(H)2-mediated allergic responses. Nat. Med. 9: 1047–1054.
. 2006. Dendritic cells transduced with SOCS-3 exhibit a tolerogenic/DC2 phenotype that directs type 2 Th cell differentiation in vitro and in vivo. J. Immunol. 177: 1679–1688.
. 1998. The suppressor of cytokine signaling (SOCS) 1 and SOCS3 but not SOCS2 proteins inhibit interferon-mediated antiviral and antiproliferative activities. J. Biol. Chem. 273: 35056–35062.
. 2001. Suppressor of cytokine signaling 3 (SOCS-3) protects β -cells against interleukin-1β - and interferon-γ -mediated toxicity. Proc. Natl. Acad. Sci. USA 98: 12191–12196.
. 2005. Intracellular protein therapy with SOCS3 inhibits inflammation and apoptosis. Nat. Med. 11: 892–898.
. 2007. STAT3 and suppressor of cytokine signaling 3: potential targets in lung inflammatory responses. Expert Opin. Ther. Targets 11: 869–880.
. 2007. Anti-B7-1/B7-2 antibody elicits innate-effector responses in macrophages through NF-kappaB-dependent pathway. Int. Immunol. 19: 477–486.
. 2010. Glutathione-redox balance regulates c-rel-driven IL-12 production in macrophages: possible implications in antituberculosis immunotherapy. J. Immunol. 184: 2918–2929.
. 2002. Macrophage effector functions controlled by Bruton’s tyrosine kinase are more crucial than the cytokine balance of T cell responses for microfilarial clearance. J. Immunol. 168: 2914–2921.
. 2003. Suppressor of cytokine signaling 1 inhibits IL-10-mediated immune responses. J. Immunol. 170: 1383–1391.
. 2006. Hydrogen peroxide inhibits IL-12 p40 induction in macrophages by inhibiting c-rel translocation to the nucleus through activation of calmodulin protein. Blood 107: 1513–1520.
. 2005. Interleukin-10 (IL-10) mediated suppression of IL-12 production in RAW 264.7 cells also involves c-rel transcription factor. Immunology 114: 313–321. 1996. The NF-κ B and I κ B proteins: new discoveries and insights. Annu. Rev. Immunol. 14: 649–683.
. 1998. NF-κ B and Rel proteins: evolutionarily conserved mediators of immune responses. Annu. Rev. Immunol. 16: 225–260.
. 1995. Regulation of interleukin 12 p40 expression through an NF-kappa B half-site. Mol. Cell. Biol. 15: 5258–5267.
. 2000. Selective requirement for c-Rel during IL-12 P40 gene induction in macrophages. Proc. Natl. Acad. Sci. USA 97: 12705–12710.
. 1993. Pyrrolidine dithiocarbamate inhibits NF-κ B mobilization and TNF production in human monocytes. J. Immunol. 151: 6986–6993.
. 1996. The interleukin 12 p40 gene promoter is primed by interferon γ in monocytic cells. J. Exp. Med. 183: 147–157.
. 1995. Suppression of TNF-α mRNA expression in LPS-primed macrophages occurs at the level of nuclear factor-κ B activation, but not at the level of protein kinase C or CD14 expression. J. Immunol. 154: 4803–4812. 1993. The I κ B proteins: multifunctional regulators of Rel/NF-κ B transcription factors. Genes Dev. 7: 2064–2070.
. 1997. Rel/NF-κ B and I κ B proteins: an overview. Semin. Cancer Biol. 8: 63–73.
. 2000. Phosphorylation meets ubiquitination: the control of NF-[κ]B activity. Annu. Rev. Immunol. 18: 621–663.
. 1999. The IKKbeta subunit of IkappaB kinase (IKK) is essential for nuclear factor kappaB activation and prevention of apoptosis. J. Exp. Med. 189: 1839–1845.
. 1999. SOCS3 is essential in the regulation of fetal liver erythropoiesis. Cell 98: 617–627.
. 2000. Suppressor of cytokine signaling (SOCS)-3 protein interacts with the insulin-like growth factor-I receptor. Biochem. Biophys. Res. Commun. 278: 38–43.
. 2004. Tyrosine-phosphorylated SOCS3 interacts with the Nck and Crk-L adapter proteins and regulates Nck activation. J. Biol. Chem. 279: 37662–37669.
. 1999. SOCS-3 is tyrosine phosphorylated in response to interleukin-2 and suppresses STAT5 phosphorylation and lymphocyte proliferation. Mol. Cell. Biol. 19: 4980–4988.
. 2001. Tyrosine-phosphorylated SOCS-3 inhibits STAT activation but binds to p120 RasGAP and activates Ras. Nat. Cell Biol. 3: 460–465.
. 2001. The MKK6/p38 mitogen-activated protein kinase pathway is capable of inducing SOCS3 gene expression and inhibits IL-6-induced transcription. Biol. Chem. 382: 1447–1453.
. 2007. Regulation of suppressor of cytokine signaling 3 (SOCS3) mRNA stability by TNF-α involves activation of the MKK6/p38MAPK/MK2 cascade. J. Immunol. 178: 2813–2826.
. 2009. Inhibition of monocyte-derived inflammatory cytokines by IL-25 occurs via p38 Map kinase-dependent induction of Socs-3. Blood 113: 3512–3519.
. 2005. Mechanisms of SOCS3 phosphorylation upon interleukin-6 stimulation. Contributions of Src- and receptor-tyrosine kinases. J. Biol. Chem. 280: 31478–31488.
. 2000. SU6656, a selective src family kinase inhibitor, used to probe growth factor signaling. Mol. Cell. Biol. 20: 9018–9027. 1987. A tail of two src’s: mutatis mutandis. Cell 49: 1–4.
. 2004. Extracellular pressure stimulates macrophage phagocytosis by inhibiting a pathway involving FAK and ERK. Am. J. Physiol. Cell Physiol. 286: C1358–C1366.
. 2007. The selectivity of protein kinase inhibitors: a further update. Biochem. J. 408: 297–315.
. 2003. SOCS3 regulates the plasticity of gp130 signaling. Nat. Immunol. 4: 546–550.
. 2006. IL-10 inhibits lipopolysaccharide-induced CD40 gene expression through induction of suppressor of cytokine signaling-3. J. Immunol. 177: 7761–7771.
. 2008. Regulation of innate immunity by suppressor of cytokine signaling (SOCS) proteins. Immunobiology 213: 225–235.
. 1999. Molecular characterization and human T-cell responses to a member of a novel Mycobacterium tuberculosis mtb39 gene family. Infect. Immun. 67: 2941–2950.
. 2006. Interleukin-10 anti-inflammatory response to Borrelia burgdorferi, the agent of Lyme disease: a possible role for suppressors of cytokine signaling 1 and 3. Infect. Immun. 74: 5780–5789.
. 1999. Interleukin-10 (IL-10) selectively enhances CIS3/SOCS3 mRNA expression in human neutrophils: evidence for an IL-10-induced pathway that is independent of STAT protein activation. Blood 94: 2880–2889.
. 1999. IkappaB kinase (IKK)-associated protein 1, a common component of the heterogeneous IKK complex. Mol. Cell. Biol. 19: 1526–1538.
. 1997. IKK-1 and IKK-2: cytokine-activated IkappaB kinases essential for NF-kappaB activation. Science 278: 860–866.
. 1998. HTLV-I Tax protein binds to MEKK1 to stimulate IkappaB kinase activity and NF-kappaB activation. Cell 93: 875–884.
. 2003. Tyrosine phosphorylation disrupts elongin interaction and accelerates SOCS3 degradation. J. Biol. Chem. 278: 31972–31979.
. 2003. Regulatory effect of SOCS on NF-kappaB activity in murine monocytes/macrophages. DNA Cell Biol. 22: 131–139.
. 2001. Insulin induces suppressor of cytokine signaling-3 tyrosine phosphorylation through janus-activated kinase. J. Biol. Chem. 276: 24614–24620.